I had the cheaper one with surface mount parts and I asked to Mr. Lawrence if I could buy another dac but with two separate power supplys. He showed me the version with double power supply and non SMD parts you also tried but didn't enjoy much over the cheaper one. I tried many topologys with these dacs but didn't tried the tube output stage. 1- Double power supply model with non SMD parts is for me way better than the cheaper one. 3- I hate caps in the signal so I bypassed all the caps in the signal. 6- To get rid of this 0.85V at the output of the op amp, there's a 1k in series with the output that goes to the RCA plugs, After this 1K resistor, connect a 14.7K that goes to the -12V that feeds the op amp. 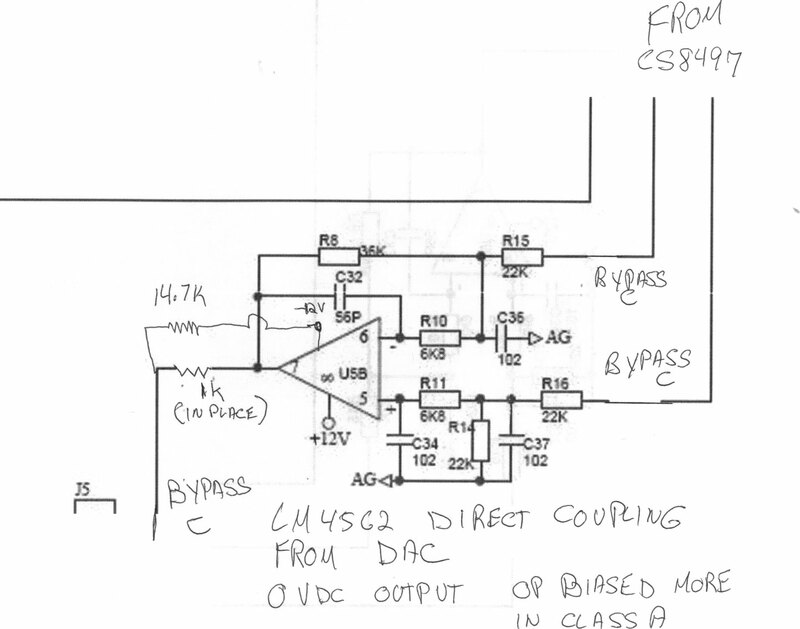 This will cancel the 0.85 V at the op amp output and the op amp will be more in class A operation. The DAC will be directly coupled without any cap. The LM4562 needs at least 100 hours of breaking time to play correctly.